Jackie is doing a practicum under the supervision of Dr. Vincy Chan towards completion of a MPH Epidemiology at the Dalla Lana School of Public Health. 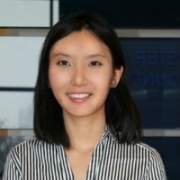 She previously completed a PhD at the Department of Molecular Genetics, University of Toronto, from where her passion in health data analytics propelled her into the field of epidemiology. She is involved in studies on the impact of comorbidities on mortality, functional outcomes and financial burden among individuals with traumatic brain injury.